The public agitation against hikes in tariffs, levies and taxes seems not to end, as two groups yesterday raised red flags and threatened various protests if the government did not review the current tax regime. While members of the Ghana Union of Traders Association (GUTA) threatened various forms of action in two weeks if the government did not review taxes that they said were crippling their businesses, road transport operators warned to embark on a nationwide strike from Monday, February 8, to protest against a 500 per cent increase in insurance premium. At a press conference yesterday, executives of GUTA, with the Ghana Institution of Freight Forwarders (GIFF) shared with journalists “the excessiveness” of the government’s tax regime, some of which were “imposed without the slightest regard for the views and plight of all stakeholders”. According to them, they had given a two-week notice within which members would be wearing red armbands and draping red cloths at their places of business to show their displeasure with the government and Members of Parliament (MPs) for increases in the rates of some taxes and the imposition of new ones that were “overburdening already exhausted members”. 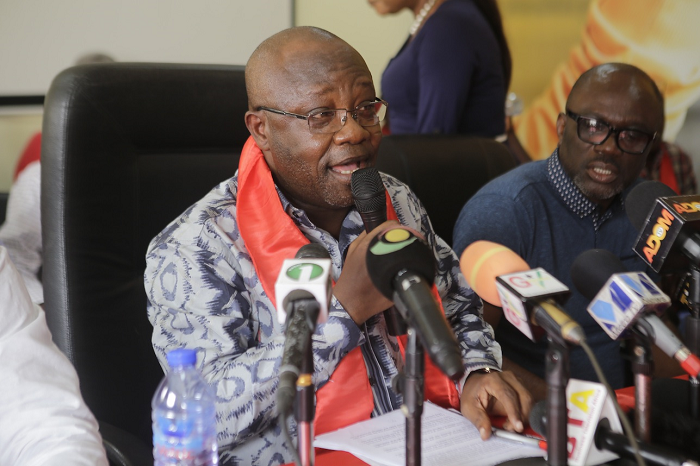 Addressing the press conference, the President of GUTA, Mr G. K. Ofori, said the association could not hide its total disappointment in MPs who were supposed to represent the interest of the people. “What we have observed is that they are always quick at passing any bill brought before them by Cabinet, without due consultation with stakeholders. “Our MPs, therefore, cannot escape blame of helping the executive arm of government to worsen the plight of Ghanaians,” he maintained. Mr Ofori also shared with journalists how the various tax regimes provided the opportunity for those in power to wantonly use their positions to destroy businesses. Charged members of GUTA intermittently shouted yentua (we won’t pay); Ghana abre (Ghana is tired)”; Bo ho biem (say it again)” as their executives briefed the media. When the executives announced a two-week period before any mass actions, members besieged them, while protesting that the two-week period was too long. Mr Ofori said the government was employing all kinds of tactics to smuggle through the back door and institutionalise taxes that the public had condemned. “For instance, the 17.5 per cent VAT/NHIL on bank service charges is still being charged by the banks,” he said. He challenged all to check their bank balances after each transaction as that would give them the evidence of the ongoing practice. Similarly, Mr Ofori charged Ghanaians to ensure that the one per cent withholding tax on investments was removed and not smuggled through the back door like the bank service charges, as it was a “killer” tax. “Also, an obnoxious tax like the two per cent special tax on imports, that the government had promised to remove, has not been done,” he said. He said members were not against any “genuine” post clearance audit if the Customs Division of the GRA was able to prove “beyond reasonable doubt that an importer is really engaged in a deal that may lead to tax evasion”. Mr Ofori said a one per cent tax on CIF value for the defunct Destination Inspection Companies (DICs) had surreptitiously been converted into a Customs Classification and Valuation Report (CCVR) fee. “This is a complete extortion of importers’ money by the government in the name of revenue mobilisation,” he stated. He explained that the Customs Division of the GRA was a state agency financed by part of the taxes like import duties paid by members. He said it, therefore, defied logic for the tax to be maintained with the scrapping of the DIC’s, particularly when assurances had been given of efficiency with the single window system that replaced it. Mr Ofori said the ECOWAS Common External Tariffs, that took off on February 1, 2016, had to be suspended to allow for proper consultation. He said the association was baffled by the government’s hurry in imposing the tax as an excessive addition to the excruciating tax burden, when the common currency better integration of the sub-region had yet not been achieved. For their part, the transport operators, made up of the Ghana Private Roads Transport Union (GPRTU), Ghana Committed Drivers’ Association (GCTDA) and the Ghana Road Transport Coordinating Council (GRTCC), said their decision to go on strike had become necessary following the recent increases in road transport-related charges and the failure of the relevant institutions to heed their call for a reduction. At a press conference in Accra, the Chairman of GCTDA, Mr Charles Danso, who spoke on behalf of the group, accused the Ghana Insurance Association (GIA), the Ministry of Transport and the National Insurance Commission (NIC) of acting in bad faith. “It will be recalled that in June, 2015, the Ghana Insurance Association (GIA) attempted to impose an 800 per cent increase in motor insurance premiums (third party),” he said. That, he said, was, however, fiercely resisted by the GPRTU, GCTDA and GRTCC, leading to a reduction of the premium to 400 per cent increase, which they again rejected. Following continued negotiations between the Ministry of Transport, Road Transport Operators, GIA and NIC, a mutually agreed incremental rate of between 240 per cent and 260 per cent was arrived at,” he said. According to Mr Danso, instead of applying the agreed incremental rate of between 240 per cent and 260 per cent, the GIA had this year, rather increased the 400 per cent premium rate to 500 per cent. He said the group had given the relevant institutions two days to reduce the motor insurance premium rate to the agreed percentage of between 240 per cent to 260 per cent, otherwise they would proceed on their intended strike.